GIGABYTE’s overclocking line of motherboards has a strong tradition of shattered world records and a host of enthusiastic owners. Reaching at least as far back as the days of Intel's X58 chipset for CPUs based on the Nehelem microarchitecture, the distinctive black and orange motherboards have been a fixture for almost every Intel performance chipset since. From the start they have emphasised pushing the CPU to the highest levels possible, with rock-solid stability and components to match. 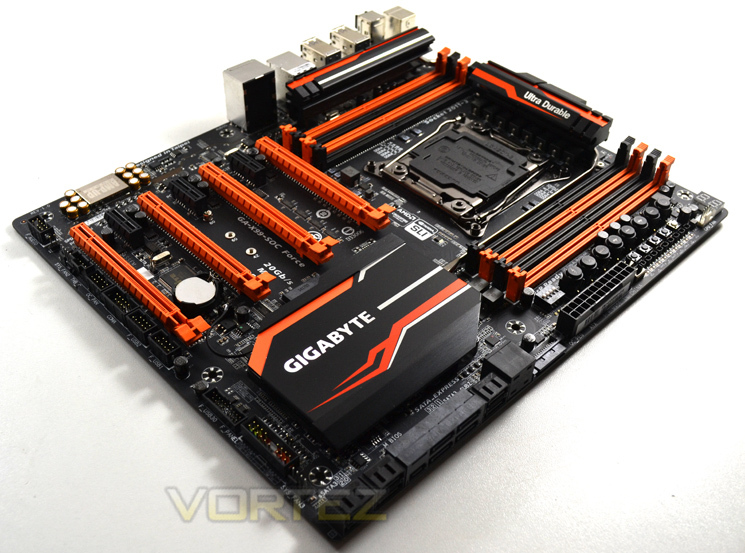 Up today is the GA-X99-SOC Force, the latest and greatest of GIGABYTE’s Overclocking Series. Based on Intel’s X99 Express chipset, it’s built to support the new Haswell-E CPUs through the LGA2011-3 socket. However it’s also one of the few to additionally support up to 4-way GPU configurations and has been assembled to GIGABYTE’s own Ultra Durable standard, which they claim gives it the greatest chance for stable operation at high speeds. Complementing the rock-solid choice of components is a set of overclocking tools which makes the X99-SOC Force as at home on a test bench as in a PC case (although one should ensure that said case can fit an EATX motherboard). Naturally however there is a tradeoff; immense overclocking potential at the £300 price point comes at the cost of other features you might expect from an X99 motherboard at this price point. That means no WIFI, Thunderbolt, nor secondary LAN chip; in fact a cursory glance reveals a list which is sparse as far as it goes. From the outset therefore the X99-SOC Force is revealed as a motherboard for the real overclocking enthusiast. Want all-mod-cons to squeeze the most out of your money? There are plenty of other options. This ‘board is for those who are going to push their CPU to the limit, and at times beyond.